What does Knott’s Berry Farm have to do with being Jewish? Not much generally, but it played a surprisingly strategic role in my formative years. That’s why it was a poignant stop on our recent visit through time to important landmarks of our hanabada days, growing up in Orange County, California. 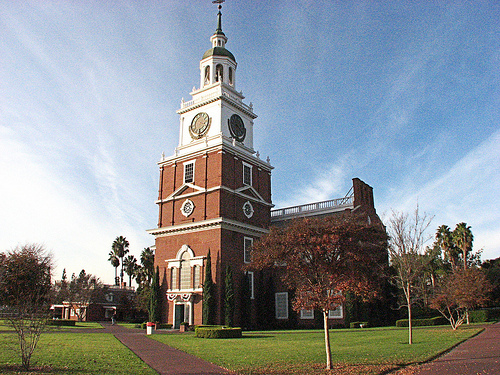 My parents sent us to Religious school on Saturday mornings at Temple Beth Ohr, about a five minute drive from our house in Buena Park. Before I was of school age, I’d go with my father to drop off my older sisters and while they were learning the Shema or how to make Hamantashen, we would enjoy a few hours at nearby Knott’s Berry Farm. 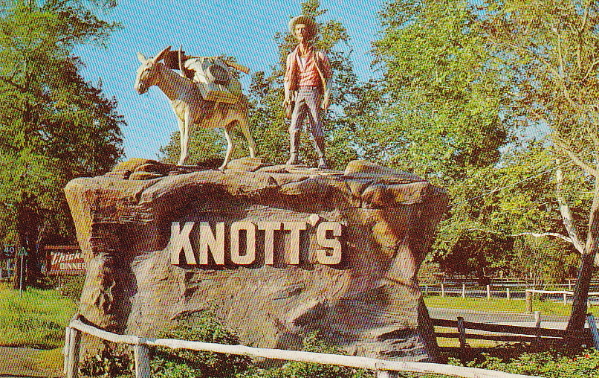 In those days, Knott’s was not a major amusement park, but a small town attraction. We did not have to pay an entrance fee and there were only a few simple rides near the famous Ghost Town and Independence Hall. He would get some coffee and lift me up onto a colorful horse for a spin on the merry-go-round. Later I’d sit in a nearby electric car and he’d drop a coin in the slot. I would jiggle the steering wheel back and forth, pretending to drive while the car shook me back and forth enough to thrill my four-year-old sensibilities. Every so often, we walked over to the other side to the semi life-sized cars that we could really drive along a track (like the Autopia ride at Disneyland.) They aren’t there anymore. Soak City now occupies that spot. He pressed the gas pedal and let me steer as we zigged and zagged across the track. I’d squeal with delight. It always felt like an extra special morning when my dad and I would go for a ride in those cars. A few hours later we would return to the Temple to pick up my sisters and head home, where I suspect that my mother was cherishing the last few precious moments of peace and quiet and a break from her three Jewish daughters that Religious school, my father and Knott’s Berry Farm offered on a weekly basis. Believe me, I can relate. That’s why, when I was talking to the guy sitting next to me on the plane ride to LAX and he said that the first place he goes to eat when he gets to Southern California is Knott’s Berry Farms’ chicken dinner restaurant, I knew that we had to go there too. Besides the fact that I know my sister loves fried chicken, the park itself holds memories for all three of us Gershun girls. We took the Beach Boulevard (Hwy 39) exit from the I 5 Freeway and headed south. My father’s law office used to be on Beach Blvd. and Orangethorpe Ave.. We had a fleeting hope to catch a glimpse as we hurried towards our destination. But alas, it is now just an empty lot. Luckily, some things never change. As we approached the intersection of Beach Blvd. and Knott Ave., and the berry farm itself, we laughed that the kitschy stretch of road doesn’t look much different. 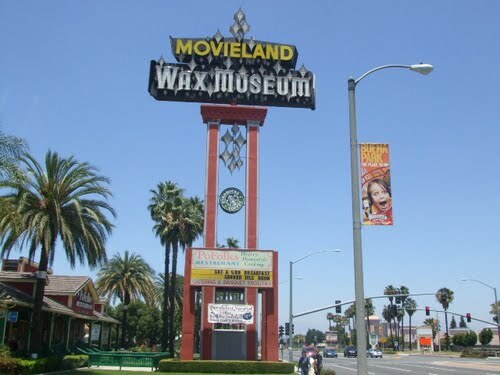 I was surprised to learn later that the Movieland Wax Museum closed in 2005 and is now the Movieland Plaza. It was not apparent from our quick glance as we drove by. I never went there or to the California Alligator Farm that closed in the 1980’s or Medieval Times that popped up after I left for college. 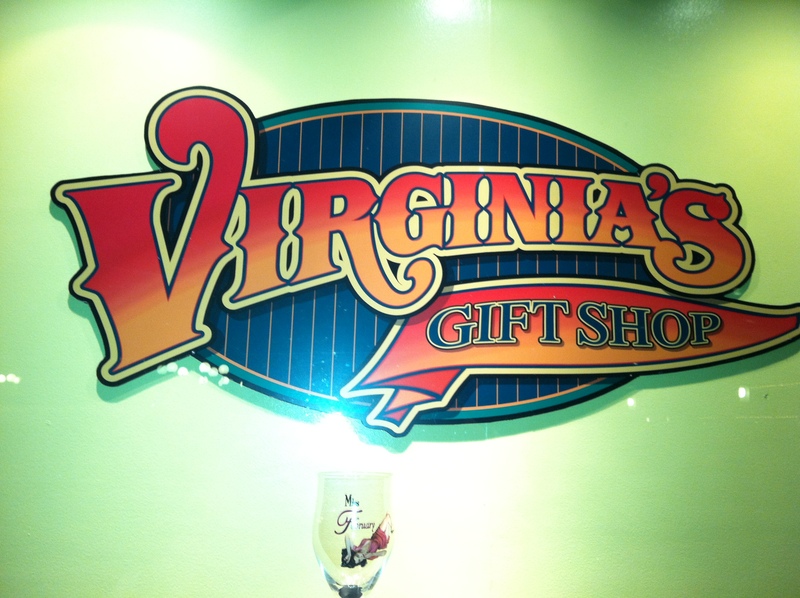 After dinner we walked over to Virginia’s Gift Shop, which evokes clear memories of our mom. My mom LOVED to walk through Virginia’s Gift Shop for what felt like hours looking at every single item on display to her heart’s content. It did not matter that her tired, youngest daughter (that’s me) had not an iota of interest in the china and crystal and tchachkes that went on for display room after display room. She had spent the day letting us do what we wanted and now she would have a moment of her own pleasure. I gotta say that, after all these years, I was still not very interested in the amazing array of gifts the shop has to offer, but it was a very nice memory. On a side note: when I was in high school and our Temple youth group planned social activities, we did not go to Knott’s Berry Farm. We went to Disneyland and Magic Mountain, but not Knott’s. Walter Knott was a known member of the John Birch Society. In those days it was said that they were anti semitic. Thus, we did not patronize the establishment as a Jewish organization. Another change surprised us and also gave us a new connection to Knott’s Berry Farm. They now have a Pink’s hot dog stand that replaces the same cafe where my father used to buy coffee on those Saturday mornings over 45 years ago. Ironically, we are related to Pink’s on my mother’s side by marriage. My Great Aunt Shirley Freidman’s maiden name is Pink. She was married to my Great Uncle Eli and was the sister of Paul Pink who started the dogs in LA in 1939. They were both the greatest aunt and uncle you could imagine. 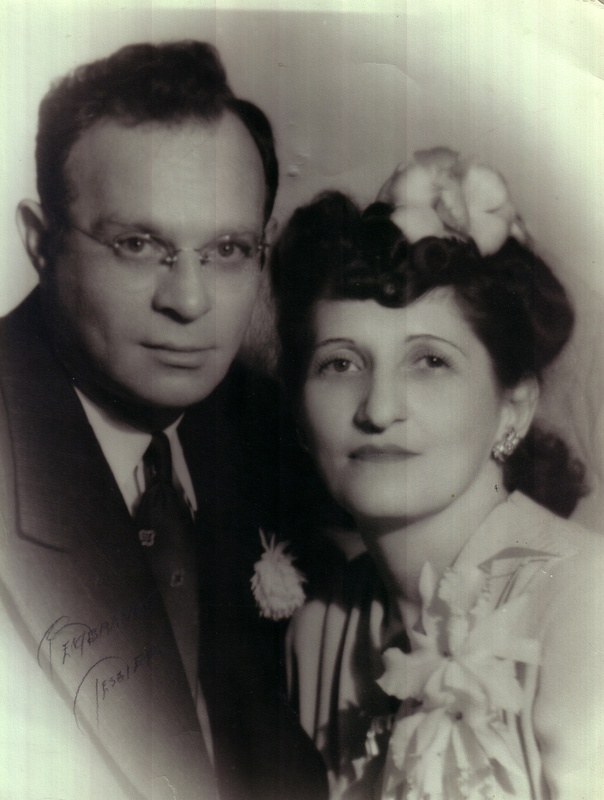 My Uncle Eli was my mother's great uncle, brother of her mother. 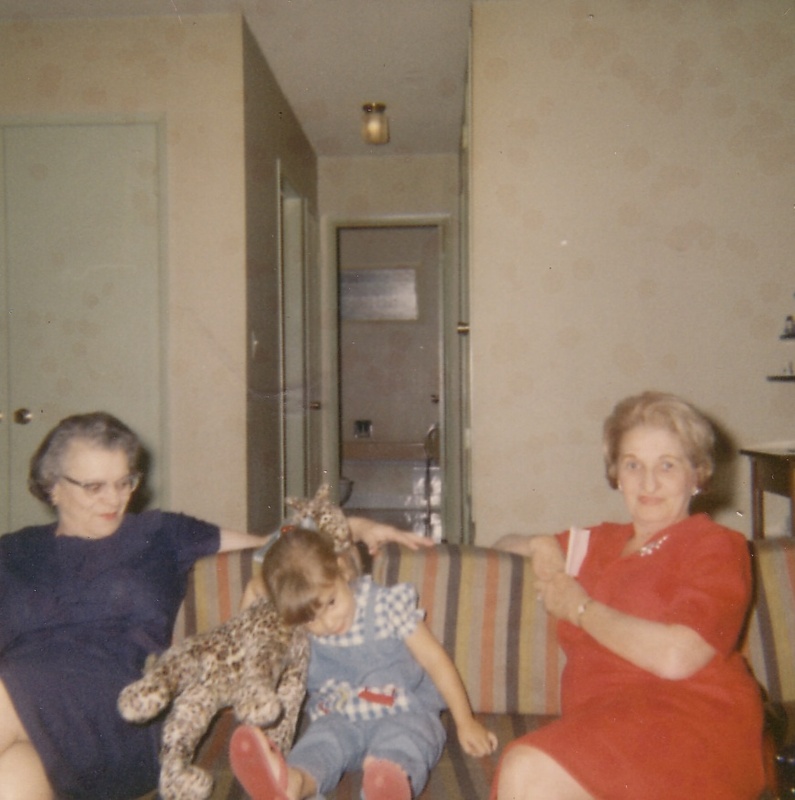 I am sitting with Aunt Shirley and my maternal grandmother Blanche Polsky, Uncle Eli's sister. 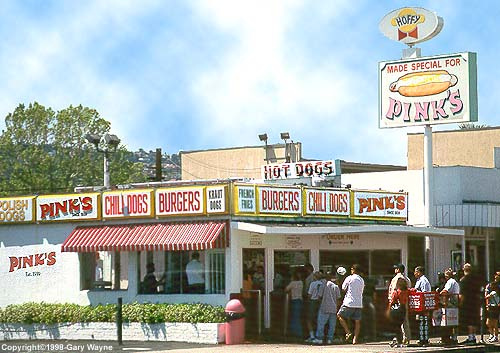 I remember driving in to L.A. to visit them and on several occasions, stopping at Pink’s for a dog. There were also many late night visits when I was in college, but that’s a different story. That’s the end of my story about Knott’s. I have to thank my seatmate on Hawaiian Airlines flight 10 from HNL to LAX on January 11, 2012. 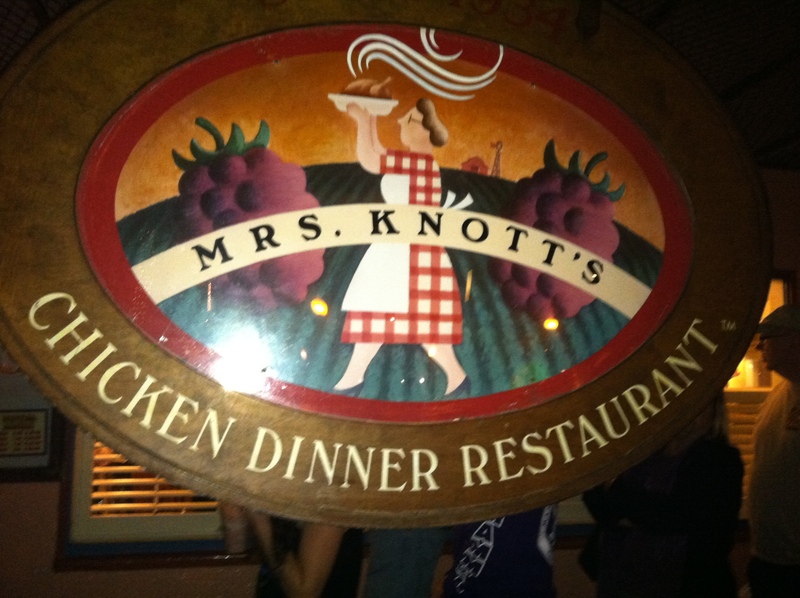 If he had not mentioned his affinity for a chicken dinner at Mrs. Knott’s Chicken Dinner Restaurant, I would not have thought to add it to our itinerary. We would have missed a plethora of wonderful memories and a chance to write this blog post. I sure hope that Walter Knott wasn’t really an anti Semite and that he is not rolling over in his grave about the fact that Knott’s Berry Farm plays a supporting role in my memories of growing up Jewish in Buena Park, California. Very interesting article. Growing up in New yourk City, I never went to Knott’s Berry farm, but like Pepperridge Farm cookies, Knotts berry cookies are Kosher Dairy and and are also available here. (I buy mine at Ross’s on keeamuku). I wonder, is the Knott’s eatery kosher? Hi Harold, thanks for reading. I like Pepperidge Farm cookies too…very much. I don’t know if Knott’s eater is kosher. That’s a good question. I wonder if Pink’s makes kosher dogs. Aloha. I too remember going to Knott’s Berry Farm as a kid, but…not very often. In fact, we had to beg to go there. 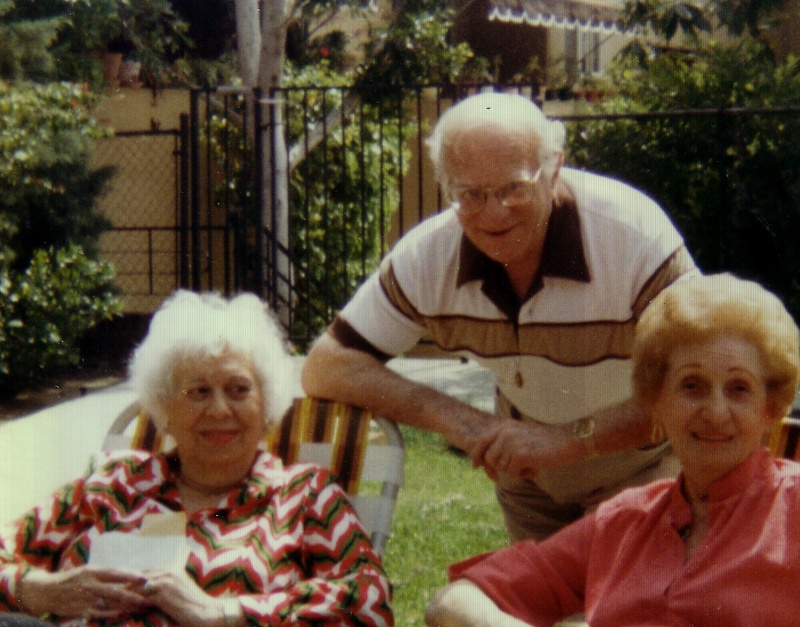 Being Jewish, my parents did NOT want their money going to the Knott family. Disneyland? Fine. In fact we went there a couple times a year. But Knott’s? VERY rarely – especially after they put the walls up and we had to pay just to get in. With that said, I have found memories of the log ride, the mule train, the ghost town, an of course, putting pennies on the train track to have the crushed for our souvenirs for the day. Hi Marni, putting those pennies on the track was always so exciting! Shabbat Shalom and Aloha. 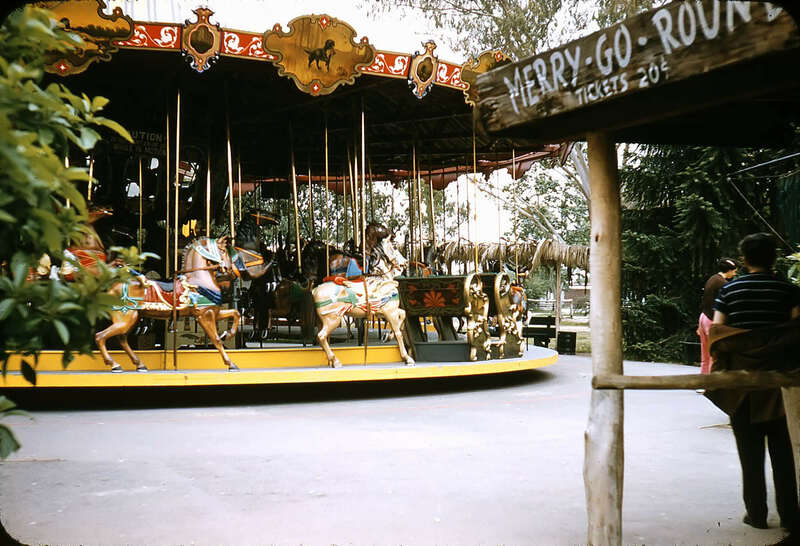 I remember the dusty merry-go-round swing that we sat in and the seats swung out in a slow arc as the ride gained momentum.Was it powered by horses, or real electricity? Was it really “Uncle Eli”? I always thought it was “Uncle Ely”. Makes no difference, really, just another shattered image from my youth. The more I think about it, the more I think you are right, youngest sister. It is a Y. I just haven’t seen it spelled that way in a very long time. 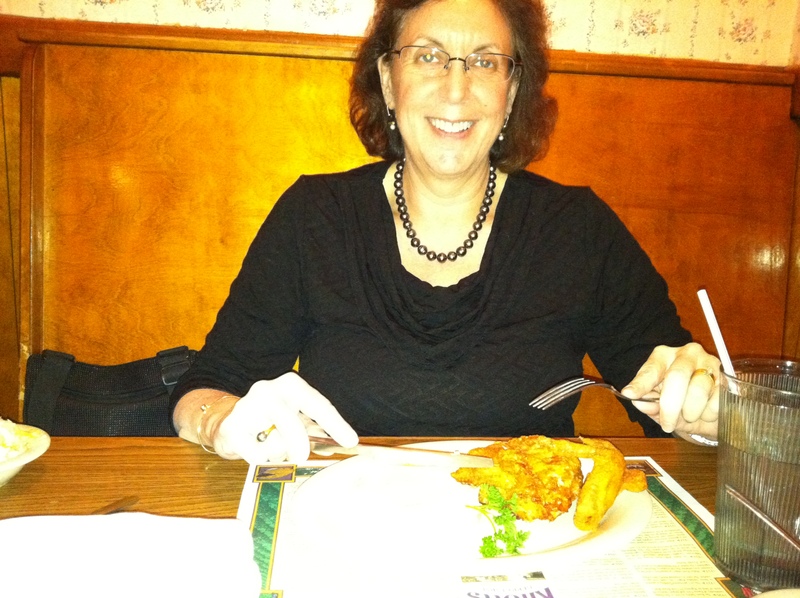 Hi Lori, Thank you for reading. I wonder how he’d feel that there’s a hot dog stand founded by a Jewish famliy next to the Chicken Dinner place….Aloha from Hawaii. I hope your son got some rest after the NFTY event! I was looking for information about Walter Knott and the John Birch Society to explain to my hometown (Long Beach) facebook group why we stopped going there. Up came your blog article. And as for Pink’s, when I moved to Los Angeles, I ended up living right off Fairfax. We know Pink’s well. So much for six degrees of separation. Knott was an anti-Semitic Bircher. He sponsored Goldwater TV ads and The Minuutemen, the Liberty Lobby and the Christian Defense League of Rev GLK Smith. One of his German born managers was interviewed by the FBI after detailing advance info about JFK’s murder. Google Warren Commission Knotts Berry Farm. Rev Smith was also an anti-Semite and attended a post assassination meeting of JFK conspirators at The Winnipeg Airport. Knott feared Communism and/or Kennedy would lead to unionization of his employees. Knott also sponsored Smith’s Nazi Silver Shirts violent organization during World War II. Thanks for sharing this story. I happened across it while on Facebook. Seeing Pink’s made me stop to read. We, too, had the belief the Knott’s was anti-Semitic. It didn’t stop us from going once every couple of years. Back then it was a schlep from Culver City. My mother’s first cousin was married to Paul’a daughter, Beverly, before he passed away at an early age. We lost contact with her after his death (some sort of family squabble ensued, from what I’m told). So I guess we’re distantly related by marriage.